Having an inflatable hot tub is a great way to enjoy your winter. Do you know which inflatable spa to purchase for the winter? Well, I have reviewed the best inflatable hot tubs to buy. You all agree with me that soaking your body in a hot tub is a fascinating experience in winter. You can as well use these inflatable hot tubs to endure cold months apart from winter. Having an inflatable hot tub at you house will be an added advantage in surviving the harsh winter. Below are the reviews of the best inflatable spas starting with the best quality. However, your choice and preference will significantly determine which spa is best for you. This spa is luxurious and comes at an affordable price. It has a capacity of four people, and a volume of 210 gallons. Why buy Intex PureSpa? Well, the spa has a blow-up design which makes it very attractive. The spa has an inbuilt hard water treatment. This prevents a build-up of limescale. Lime scales cause massive damage to any spa by clogging the filter cartridges and the pump. Just like many inflatable spas, Intex comes with a cover. Using an inflatable spa without a cover is a bad idea. Your electricity bill will be very high. Intex can serve two functions at the same time. This is very rare in other portable spas. You can turn on the heater and still enjoy the massage jets. The spa is octagon-shaped, a unique design. This design allows more room for your legs when seated at the corners. Also, it provides a luxurious comfort similar to the one you dearly pay for in five-star hotels. We all love luxury, especially if it comes at a lower price. Bubble jets are installed at the bottom perimeter of the unit. Each corner of the unit has massage jets. They are in an adjustable manner, in that; you can adjust angles to massage specific parts of the body. For those allergic to chlorine, the spa has salt water and hard water treatment system. With these features, you should run for Intex Pure Spa. The hard water treatment system is helpful in various ways. The treatment helps overcome drying up of the skin and hair. By soaking in the spa, your skin and hair get exposed to drying up. Chemical build up in the unit is greatly reduced. This guarantees your spa a longer lifetime. A cover serves as insulation to the spa. The cover provides safety by preventing leaves, children, and dust from falling into the tub. This keeps the water clean and free from any form of physical contamination. Submerging your body in hot water with 120 air jets provides great hydrotherapy. For easier transportation; Intex PureSpa has a built-in grab handles. An extra carry bag is also provided. How do You Pack it? The process is straightforward and easy to follow. Simply drain the water and let the spa dry. Deflate and put it in a carry a bag. Put it in a spacious room like in a basement. This is the good thing about a blow-up spa, how you store it. Two functions can be run simultaneously. However, Intex comes at a higher price due to its premium design. This is another affordable hot tub that has a capacity of 4 persons. Lay-Z Spa Vegas has a maximum temperature of 104F. The water is great. This is the maximum temperature value you can ever find in a hot spa. Also, it has a cushioned air pad floor which enhances thermal insulation, improved comfort, and safety against air leaks. It has a gross weight of 86 Lb. This may seem heavy to you, but you have to understand that not all air-filled hot tubs are the same. You have to forget the light weight of your blow up baby-spa. The hot tubs have to be rigid to keep their shape in proportion. 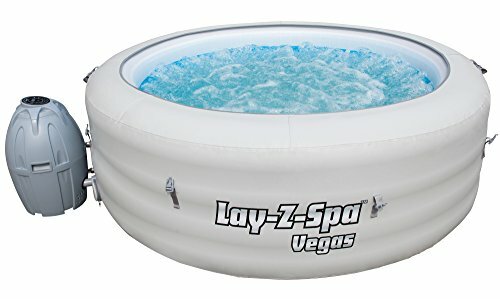 The Lay-Z Spa Vegas is made of TriTech material. These are two layers of PVC encasing a polyester mesh. Filling and draining the spa is super easy. Preferably, use a hosepipe. Filling it might take about 50 minutes. However, the filling rate depends on the rate of water flow. The water heater consumes about 1.25 kW when turned on together with the pump. This is considerably high but bear in mind that the heater only runs when you need to warm the water. Most of the time, the heater holds the temperature at the required level with less energy consumption. The spa has the most amazing feature: adorable LED mood underwater lights. Lay-Z-Spa brings to the table a great uniqueness for comparison. Though it is advertised to hold up to six persons, I recommend it for four persons due to overcrowding. It has advanced features, good quality material, and affordable price. It has a cushioned air mat floor. This ensures that you set it up on a good surface to avoid possible mechanical damage. This may include piercing by the rough floor. The cushioned air mat floor improves the insulation of heat and makes one feel comfortable while seated. This feature ensures the under-body of your blow up spa is secure. The portable spa is installed with a standard bubble jet. The massage jets are not very powerful. This offers a gentle massage for your muscles. The water temperature is outstanding. You can heat up to 104F. Not only will enjoy a warm soaking but also strengthened blood circulation. The hot tub has around 87 bubble jets. These jets use the technology of Bestways Air Jets. The bubble jets are enough for the users. In case you need a powerful body massage, look for the latest version, the Hawaii, which is more satisfying. The Hawaii version has hydro jets that bubble air and not air. Temperature control is another important factor to consider when buying any inflatable hot tub spa. SaluSpa Paris has a digital temperature control panel integrated at the top. There, you can easily start air bubbles and stop the heating system. The remote control provided only controls the LED lighting system and not the temperature. Read our full Lay-z-Spa Paris review here. LED light system is another luxurious feature to tap on. The colorful, bright lighting mimics the festive celebrations held in winter. The lighting will certainly merge in well with your winter festival. The spa has a set of seven colors which can be controlled by a remote. The illumination that comes from the bottom of the unit makes the spa more memorable. This illumination is very beautiful and amazing in darkness. During the winter period, the atmosphere is really cold. Therefore, you may require a more intense massage to relax your muscles and keep your blood circulation at the optimum level. SaluSpa Hawaii is what you need for this. It has additional powerful hydro jets. The spa weighs 1700 pounds, water alone, and a volume of 210 gallons. The spa is square shaped offering more room for the legs, especially when sitting at the corners. You should know that it is more expensive than the others. However, it has better features that make it worth the price. The water jets feature give value for the extra cash you spent purchasing. All older versions of inflatable spa use air jets. When compared to SaluSpa Paris, the unique shape allows four persons to sit at corners with enough spacing. It has two hydro jets installed on each corner. The nozzles are at adjustable angles to target certain body parts, especially your back. The spa allows you to adjust to a holistic, gentle body massage if you do not need the powerful waterjets. This means you can turn on the bubble jets. The hydro jet stops simultaneously since you can’t operate two functions in SaluSpa Hawaii at the same time. Hawaii inflatable spa is installed with two extra filtration systems. Your hair and skin are taken care of by the hard water system. This also controls chemical build up in the unit which would cause damage later on. Salt water treatment system ensures the water is clean and free from any contamination. Those allergic to water chemicals especially chlorine can benefit from this feature. It has powerful hydro jets. The most obvious disadvantage of SaluSpa Hawaii is that you cannot run two functions simultaneously. This spa is new on the market compared to its established rivals, the Bestways. Its shortcomings may not be well discovered but going by the features it offers, it has a position on my list. The spa has a four-person space. Goplus comes with a built-in handle to carry it. The unique feature that catches my attention every time I see it is the integration of the blower and heater inside the wall of the hot tub. This feature seems to use so much space thus I expect some leg touching whenever it has four persons. The spa is unique in many ways; the digital control panel is located in the wall. This allows the user to adjust the settings inside the water without having to reach over to an external control panel. Goplus has included hard water treatment system to prevent the build-up of chemicals and limescale. This also makes water friendlier to the skin. Heater and blower are uniquely built-in. Control panel is on the wall. You need to consider several factors before buying the inflatable hot tubs for the winter season. Check the maximum temperature range which the spa can operate in. Luckily, this is easy to check since most models use a standard material specification. 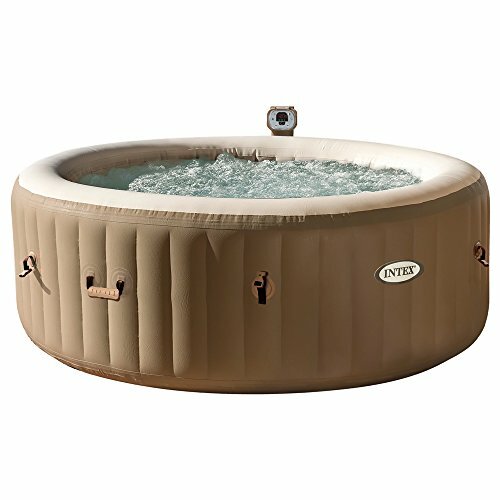 Most inflatable hot tubs range between 40 and 104F. 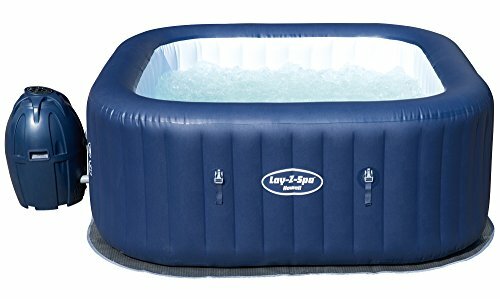 If you are living in colder areas, consider buying a more modified spa which meets your specifications.Fortunately, you can still use common models only if you will place your inflatable spa in areas where the temperature does not go below 40F. You can place your tub in an enclosed shed, unused garage, or an extra room in your house. You can make the extra room a spa room if possible. All the places should ensure the temperature does not drop below 40F. Read the instructions in the manual guide. If the temperature drops below 40F, you should not use the inflatable tub. The heater and the pump mechanism freeze at a temperature below 40F. The pump may be damaged permanently. If the temperature falls below this level, deflate the tub and wait for the weather to improve. Secondly, you can take it home or a nearby house where the temperature is higher. Lastly, clean the Inflatable hot tubs using a Spa cleaner. Keep the water warm since frozen water damages the tub. Place the inflatable tub on smooth and flat surfaces to avoid damage to the tub. The operating cost factor should not keep you worried in winter. There is no big difference when using the spa in summer or winter. Have in mind that most tubs use air bubbles which mean that water is bound to cool after some time. Simply take care of the heat of the water. If you follow these steps and apply all the above information, you will enjoy your winter in a special way with inflatable hot tubs. 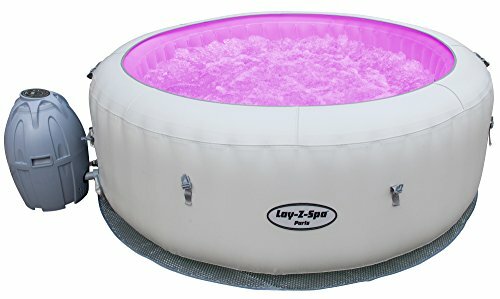 Why Buy an Inflatable Hot Tub?